Shopping Boston is just an excuse to catch up, to talk, to “get real” and break bread together. It’s never been just about shopping. We try to solve problems, we gossip, we celebrate each other’s achievements and suffer each other’s sorrows. We cheerlead and talk sense into each other while pounding the pavement, trying on clothes, getting our nails and hair done, meeting shopkeepers, and drinking wine, or specialty martinis, or craft cocktails (as each came into vogue). Our first year celebrated Sara’s new (second) marriage. Our kids – each of us has two boys – were pre-teens. This year, one son is engaged and lives in Chicago, one is in the Air Force, one lives and works in Boston and another lives and works in New York City. They are grown. As they’ve changed, so have we, and so has Newbury St. Restoration Hardware now occupies the 1862 Boston Society for Natural History building. The museum became Bonwitt Teller and then Louis Boston, where we once ogled designer fashions and purchased cutting edge cosmetics, before it was transformed into its latest incarnation as that upscale furniture store known by its monogram – RH. Through all this change, though, artist Charlie Wang, has been selling his prints and watercolors of Boston landmarks without fail for years on the corner of Dartmouth St. A constant in the constantly changing face of Newbury St., Wang has himself become a Boston Landmark. Of course Sara and I have our favorites. A few are still here, but many have closed or decamped for cheaper areas (like the cool new South End, aka SoWa Arts District). One of those is the couture fashion boutique, OKW, which became our number one preference by virtue of its friendly owners and incredible, unique clothing. We could not ignore OKW when it moved, so, every year now, we get to Boston Friday mid-day and start there. 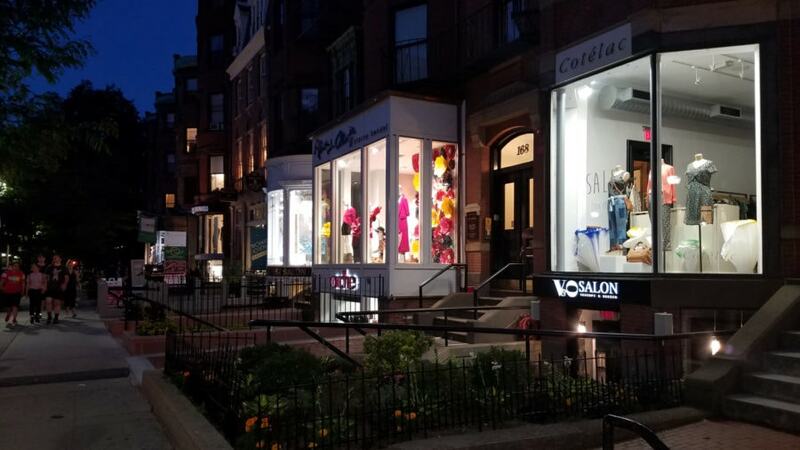 A new shopping/gallery/artist hotspot, SoWa was originally derived from a shortening of “South of Washington.” It now spans the area from Mass Ave to Herald Street and from Shawmut Ave to Albany Street. L’Attitude Galleries – a terrific art gallery that features a phenomenal selection of ceramic, metal, glass, textile and discarded flip-flop crafts and jewelry – also moved from Newbury to 260 Harrison (SoWa). ….and the beautiful Zainab Sumu, whose “Primative-Modern” African designs might soon be found at Museum of Fine Arts Boston. (But who also sells eye-catching t-shirts for $50). Newbury St., which runs eight blocks from Arlington St. to Mass Ave., can be divided into two realms, shopping-wise. The top half bordering Boston Public Garden– alphabetically, Arlington to Essex– is mostly the “high rent” district, where you’ll find the Taj Hotel, Burberry, Dolce & Gabbana, Chanel, Armani, and the like. The lower half – Essex to Mass Ave., tends toward smaller boutiques, start-ups (like Ministry of Supply), and chains like North Face and Diesel. There are several places we’ve tried once and determined not for us. We are not into fairies, unicorns, or hemp, so we’ve passed on The Fairy Shop and Hempest almost since day one. And we’ve been puzzled by the staying power of Johnny Cupcakes, a purveyor of $30 pop-culture t-shirts. And, of course, there are those places we’ve outgrown. Urban Outfitters, on Newbury at Mass Ave. had incredible summer deals on teen boy furnishings, so every year I’d stock up on lighting, collapsible chairs and desk knickknacks for my kids’ rooms. Over the years, as prices increased and inventory appealed more to the pierced and tattooed, we’d spend less and less time there. Now, next door neighbor, MUJI, is our go-to for design-forward home goods, modern clothing, and my favorite pens. Perhaps due to the historic Boston Tea Party (which happened right in this harbor), the city is tea obsessed. Two, count ’em two, high end tea shops, one local, one based in Australia, opened on Newbury Street within the last year. T2, an Australian brand, has branched out in the Americas starting here, with walls of loose tea bins, and plenty of proprietary blends. Tea Forte, a company based in Concord MA, sells only organic tea in unique pyramid shaped bags. Easy to mix and match, the vibe is more Nespresso-user friendly than your friendly neighborhood tea shop. MIT textile geniuses opened the first Ministry of Supply men’s clothing shop where they sell moisture-wicking, anti-microbial, breathable, wrinkle-free shirts for just over $100 – a bargain given that a runner completed the NY Marathon wearing the Men’s Archive Dress Shirt and, at the finish line, looked and smelled like he had just put it on. Over the years, costume jewelry stores have come and gone. Colorful plastic designer, Lalo, closed (boo hoo), but Alexis Bittar opened a stand-alone shop much to my unique-jewelry buying pleasure. I just love those 50% off sales. Speaking of a first bricks and mortar shop, Fresh opened in Boston in the early 1990’s – and has been going strong ever since. I buy my favorite makeup remover – Fresh Soy Face Cleanser – and the no-tint Sugar Lip Treatment every year. And every year, we save some time for the sale racks at Betsy Jenney (not Betsy Johnson, another favorite, that sadly closed). This year, however, I made a special purchase – the perfect Mother of the Groom dress that Betsy herself picked out for me! Betsy Jenney is crammed with funky, fashion-forward dresses, shirts, skirts and accessories. Stay long enough and something is bound to speak to you. On upper Newbury, Sara and I stop into Nespresso. Several years ago, I purchased an espresso machine there, and every year since I stock up on sleeves of coffee capsules. The Nespresso Boutique is also the perfect place for a mid-day caffeine infusion at its very hip coffee and dessert café. We’ve tried most of the dozens of restaurants on Newbury St., but constantly return to our favorites: Sonsie, with its outdoor café feel, Stephanie’s – the traditional long-standing salad spot, Dirty Water Dough for fantastic fresh pizza, and Snappy Sushi (I’m partial to the Crispy Eel Roll). This year, we tried two recent additions. While A-Listers try to avoid the paparazzi, we ate there. Actually – at Papa Razzi, a fine restaurant with good classic Italian cuisine at reasonable prices. The Met Bar, with its cool artsy vibe, is the perfect stop for chopped salads and other midday fare. Hotels on or Near Newbury St. Initially, in 2001, we looked for 4 and 5-star hotels nearby with summer weekend rates under $200, and found them. We could score a room at The Lenox, The Elliot, Park Plaza and others for a song. By the mid ‘aughts, the only place to find those kind of rates was at the Newbury Guest House right on Newbury St – and we were amazed with our large room’s classic beauty. But over time, even those rates increased. By 2011, we were hard pressed to find rooms under $300, but we did, at the Fairmont (when Adam Sandler was shooting a movie there). We’ve stayed at the wonderful Colonnade: a Maven Favorite, and the best place to stay in summer as it’s the only hotel in Boston with a roofdeck pool. Jury’s – which became Loews Boston, was our preferred hotel in the summer of 2018. In the former Boston Police Headquarters, its nostalgic, luxurious, and quirky enough to be a MAVEN FAVORITE, with it’s own write up here.